Why can’t I connect to CU-Community WIFI? We get asked this question a lot and I will admit, a lot has to go right for a successful connection. Let me begin by saying this is the standard method for wireless networking you will find at most colleges and universities. We’re not Starbucks. The CU-Community WIFI uses an encryption method based on your own username and password (this is called 802.1x authentication, if you want to impress your geek friends). With no two of those alike, you’re protected from other students “watching” your traffic with a packet sniffer. On your home network, you probably have a shared password with your family – this protects you from outsiders, but not from others on the network with that same password. Sure, I realize Mom, Dad, and your sister aren’t much of a threat to snoop your traffic (I could see your little brother being nosy, though). In any case, Castleton IT is committed to providing you the most secure connection possible. Now for the problem; your device has to recognize and support it. This is more difficult than you would imagine. Apple is famous for not testing 802.1x in many versions of OS X and even if it’s working, it could end up breaking with the next update you get from them. That has happened so many times we’ve lost count. Changing your password is problematic if you save your credentials and your device continues to try using the old one. There’s just too much complexity in the connection to list everything that might be causing you issues. But I promise you this; if you’re having troubles, bring your device to us and I’ll bet we can figure out what’s causing the problem. 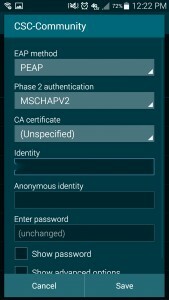 Certain versions of the Android OS are unable to automatically detect the encryption settings for the CSC-Community network. 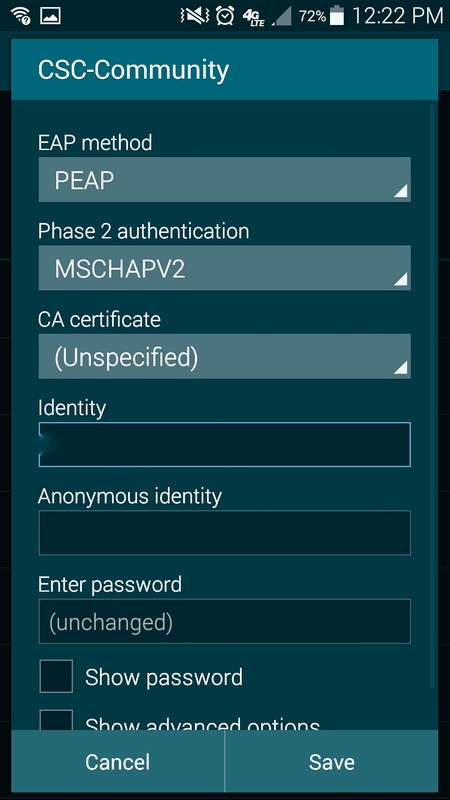 The key settings are “PEAP” for the EAP method and “MSCHAPv2” for the phase 2 authentication. Those settings along with your correct username (identity) and password should make a connection.